Young Investors!- Make money in Malaysia and Singapore! : Penang Island or Seberang Perai? Penang Island or Seberang Perai? If you have extra RM20k to invest in a property, will you choose a property in Penang Island or Seberang Perai? That's a difficult question! I will just share with you a story, I bought my first property in 2001, a landed terrace house in Simpang Ampat. 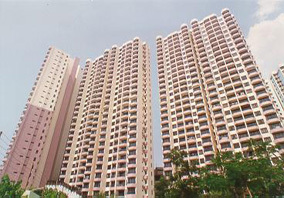 My brother in law also bought his first property that time,a 1000-square feet condominium in Sungai Ara, Penang Island. What is interesting about these two properties is they were same price in 2001- RM170K. I was quite confident that I made the right choice because what I had learned so far that time was landed property always appreciates faster than condominium. But I am totally wrong. In 2011, his Sungai Ara condominium has appreciated to RM380-400K but my ' LANDED PROPERTY' in Simpang Ampat is still just RM230-240K and the worst part is you just can't find any buyer in Seberang Perai Selatan. So, am I hinting that you should buy a property in Seberang Perai instead of Penang Island? I think it all depends! It depends on a few factors, how much money you have and the time frame you can hold to that property. Certainly we are not talking about buying property for own stay, I am talking about buying investment property. If you have enough funds ( more capital) and hoping to get return in short team, then buy Penang Island property. However, if you have less money but can hold on that property longer, I would suggest you to buy Seberang Perai Property. I was suprised last week to find that a bungalow in Raja Uda, Butterworth is now selling more than 1 million. And I can assure you that the Semi D I bought in Simpang Ampat about 4 years ago has appareciated for more than 40%!! Yes, you are right! When everyone is greedy ( and aiming for Penang Island property), why can't you just look beyond and find other oppoturnities in Seberang Perai!